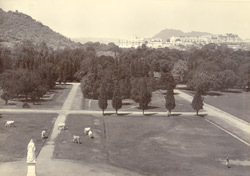 Photograph from the 'Curzon Collection: Album of views of Udaipur and Chittaurgarh', of the palace, Udaipur taken in c.1905 by an unknown photographer. The palace was begun by Maharana Udai Singh (ruled 1567-72) and continued into the 18th century. It stands on a rocky promontory on the east shore of Lake Pichola. Its cupola-topped towers and fortress walls are visible in the distance at right, with hills beyond. The palace is seen from the top of the Victoria Hall which lies to the south-east. The grounds of the hall and a statue of Queen Victoria are in the foreground.